A rainy Sunday provided an opportunity to kick back on the couch and enjoy the simpler things of life: my family, nestled neatly up in a blanket-covered pile of bodies, affording the opportunity to share the contemporary classics of my youth with my children, aged seven and nine. Right. So this was a bad idea, but I simply walked in on it from another room, and at first, chuckled. I remembered the basic plot, but the finer points were lost to literally half a lifetime watching other film and media since ‘Pleasantville‘s release in 1998. First and foremost thought resonating from the viewing was the sudden and unexpected reminder that pre-‘Malcolm In The Middle’ Lois (Jane Kaczmarek), the Mom from the eponymous television show, was the middling 40-year-old mother (credited, hilariously, as only ‘David’s Mom‘) to David (Toby Macguire) and Jennifer (Reese Witherspoon). It was sudden; unexpected, and took me out of the ending for a moment. Having seen and enjoyed her in a more comic fashion, I couldn’t take her seriously as a dramatic actress. Much like Leslie Nielson, her dramatic turn was…laughable? Again, unexpected? Writing this, I’ve explored her IMDB page, and found her to be all over the place as an actress; movies, television, voice work, and yet, nothing stands out as memorable. She’s just always be ‘Lois’ to me. First watching in the late 90’s, I know I empathized with Macguire’s character as an awkward high-school teenager. I was enamored with the simpler life he finds in old reruns of his favorite black-and-white television show, the titular ‘Pleasantville.’ His escape from the nuance of life into black-and-white simplicity is figurative, literal, and, emotional. This world is easier. This escapism works in the concrete; absolutes about class, issues, and culture in 1958 White Suburbia. Considering the difficulties of real-life 90’s as a teenager (been there), one can understand why a socially awkward teenage boy might find solace in such shows with strong men, loving mothers, easy plots, and a moral tale book-ending each episode. Nothing hard here; only simple, escapism television. I empathized with the David/Bud character as a pimply-faced, curious and unsure teenager. As I’ve grown older, had children of my own, and become more aware of the world at large, the bigger themes I didn’t catch in my youthful naivete resonated much, much harder. I couldn’t appreciate the T.V. Repairman’s (Don Knotts) motivation to hand off the Deus Ex Machina responsible for David and Jennifer’s adventure. Why did he care so much to give it to David? As a literary nut teenager, it was simply plot device; as a man double the age, it was passion. It was finding someone with the same love, intensity, for a simpler time. It was a gift of love from one man to another, in appreciation for the time and effort David had put into loving those characters and that world. I’d have never seen that 16 years ago. 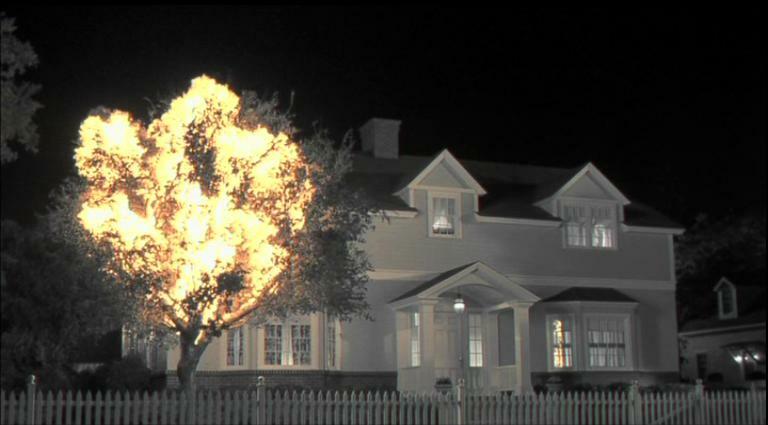 Youth attaches the sexual themes of the movie, of which there are many, including the favorite water faucet/exploding tree sequence everyone can recall with a bit of naughty glee. When the movie started, that was the resounding image I had from my memories, and I chuckled as I sat down to watch, curious how my wife was planning on explaining that to my children. Have no fear; we fast-forwarded through the PG-13 parts, leaving my nine-year-old very confused as to how the world was changing without any plot driving it. There’s another image that stands out in my head; the one that was supposed to stand out and mean something, powerful, and I completely missed it when I was younger. While I was hung up on the innuendo and sexual overtones, there was something else going on there, obvious and yet oblivious to the young man watching. The older, wiser me saw, for the first time, the by-products of the changes Jennifer and David were making, and how human nature was being more realistically reflected back to them. I’ve got to believe I picked up on the ‘colored’ theme, the isolation, the misogyny and patriarchy inherent in this “perfect” T.V. world. I can’t believe I wouldn’t have noticed it; I would believe that maybe it didn’t affect me the same it does now. Having seen more of the world, experienced what hate, bigotry, and what fear of change coupled with dogma can do, the third act of this movie hit harder than any housewife discovering her sexuality. The book-burning was not imagery I was familiar with when I watched this movie the first time. This time, it took me aback and disturbed me. I’m choked up as I think about Bud handing Bill Johnson (Jeff Daniels) the art work, and the subsequent works he creates. Among everything you can say about art and one’s nascent discovery of it, he makes the townsfolk of Pleasantville feel something, and that something is uncomfortable, beyond the threshold of their comfort, and they destroy everything beautiful to him because of it. This is art reflecting reality reflecting art. The whole third act is wonderful, because it breaks down the social stigmas attached to this “perfect” little society. George Parker‘s (William H Macy) demand for dinner is less a request for food, but for the normal structures of his day-to-day. By the end of his repeated pleas for dinner, he’s no longer looking for food; he’s looking for the life he, and everyone around, used to have. The Bowling Alley (and then, the City Hall) was over-exaggerated for effect, but it detailed, in full order, just how far the power structure will go to maintain status quo. 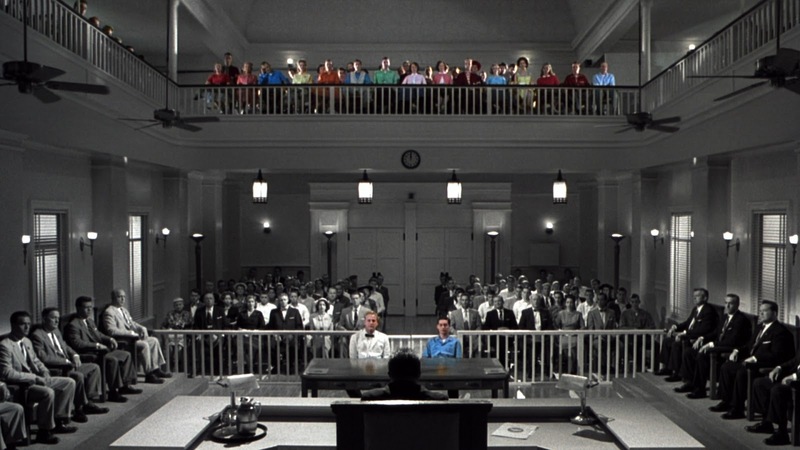 The final scene of the City Hall, with Bud and Bill Johnson on trial (the image I used for the header of this), is the only scene that I keep coming back to when I think of this movie. There’s the Black-And-Whites down on the floor level, and The Coloreds in the galley. The imagery was shocking, once I had context to work with with. In 1998, I knew what it was, but I didn’t, truly, know what it meant. I think I’m luckier for that, really. Words can’t express what the scene meant; only that it hit hard, unexpected, and powerfully. After that, the movie wraps up in a little bow, if not for the little nod at the very, very end with Jeff Daniels. If I wanted to work the pretentious route, I could say something like “How ridiculously heavy-handed; slap me over the head with the symbolism.” However, I won’t. Sometimes, a slap is exactly what we need to get us out of our complacency. It gets our attention. Bravo, Gary Ross.